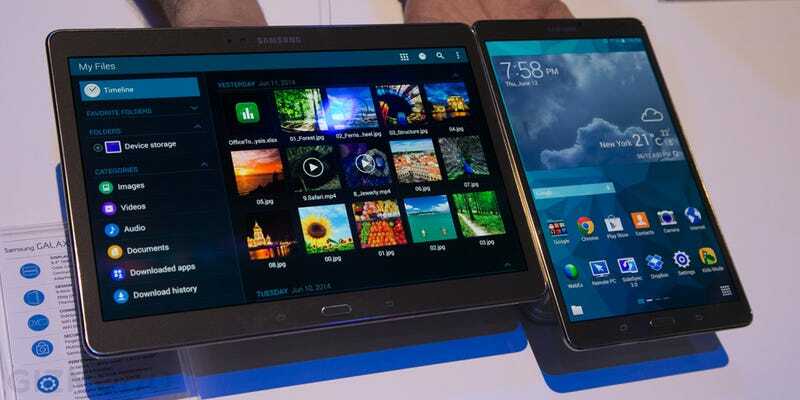 Samsung's Galaxy Android phones have been a terrific success—its Galaxy tablets, not so much. Meet the Galaxy Tab S, Samsung's crack at making a tablet as great—and as appealing—as the Galaxy S5. The new Tab S replaces last year's Tab 4 and comes in 10.5 inch and 8.4 inch models with Super AMOLED displays, both at 2560 x 1600 resolution. When Samsung teased today's event, it spent most of the time talking about color, and that refers to the AMOLED display, which is more saturated and vibrant than the old LED (Xperia Z2) and TFT LCD (Galaxy Tab 4) displays. The tablet comes in quad-core and octo-core versions depending on region—in the US expect a quad-core Snapdragon chipset. 3GB of RAM no matter what. The Tab S runs a skinned—albeit attractively skinned—version of Android Kit Kat 4.4. Samsung will also be offering a Bluetooth keyboard, and super slim covers—you know to compete with the Surface keyboard and the iPad's slick cover. They're super slim—just 6.6mm thick—though not as slim as the Xperia Z2. They weigh 465 grams (10.5 inch) and 294 grams (8.4 inch). The dimpled back takes design cues from the Galaxy S5. Also like the Galaxy S5, the Tab S has a fingerprint scanner that'll remember prints for up to eight different users. Oh and it's trimmed in gold(-colored something)! "AURA OF LUXURY!" At least that's how Samsung puts it but we think it's a liiittle tacky. Samsung spent a lot of time talking about the bundled services, and partnerships for content from magazines to comic books to movies. Though the display is no doubt beautiful, there doesn't seem to be much else going on here. Personally, I'm not quite sure why I would buy this rather than an iPad. Both sizes will be available in July. The 10.5-inch model goes for $500 and the 8.4-inch goes for $400. I just spent a little time playing with both versions of the Tab S, and on the surface at least, the hardware is glorious. It's super skinny—much skinnier feeling than I was expecting. As Samsung promised, the Super AMOLED display is very striking with its high contrast and deep color saturation. We watched some canned nature footage and no surprise: It looked pretty. Despite its high-screen resolution, the tablet was snappy with no lag as I browsed the Internet or flipped through a magazine. Of course, this could not have been a less risky design for a product, and it'd be hard-pressed to take any major strides towards beating out the incredibly popular iPad. Even Microsoft has realized that's not a fight worth fighting. What's the reason if a fingerprint scanner and resizable apps are almost certainly coming to iOS hardware soon? I can't think of a good reason, except maybe that you like Android. Or, somehow, Touchwiz. Still, it seems like good hardware, but just nothing wildly compelling.